Somewhat forgotten amidst tales of amphibious attacks on the Omaha and Utah beaches and the prelude to the great battle of Normandy, the ferocity, scale and importance of the attacks to liberate Carentan had all the trappings of a major battle. In addition to the countless demonstrations of bravery, the strategic situation was complicated, with a siege punctuated by terrifying land and sea-based shelling and a second act of unprecedented violence that was made conspicuous by the titanic clashes between the US army Task Force and a division of the SS Panzer Grenadier. Indeed, the battles to liberate the town itself between the American paratroopers and the German fallschirmjaeger, gave way to a large scale confrontation in its defence, as well as the establishment of a secure line of resistance and the prelude to the battle of Normandy. 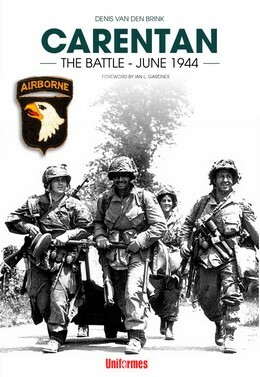 Today, Carentan still retains a number of sites that are inextricably linked to the history of the 101st Airborne Division and that of the American airborne forces, including Brévands, La Barquette, Purple Heart’s Lane, Bloody Gully, Bloody Gulch and Hill 30… The men who fought, suffered and lost their lives there, remain in the collective memory of the Normans of Carentan, the heroes with the triumphant faces of GIs of 1944. Author, Denis van den Brink is a specialist in the American parachute regiment in the Second World War. He has written numerous articles and works, including “Les Paras de le 82nd Airborne” and translations of books by American specialist of the 101st Airborne, Mark Bando.